I've just recently finished Hugh Howey's Silo trilogy at the recommendation of my significant other, and it's got me thinking about end of the world fiction. 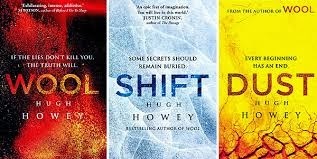 More and more, as I read the second and third novels in this trilogy (Shift and Dust) I became convinced that Hugh Howey must be a fan of Margaret Atwood. While the Silo trilogy is distinctively American, particularly in its description of the US Government's involvement in the central premise, both novels are anti-establishment and environmentalist in scope. The end of the world, in other words, has been caused by us. We have ruined our landscape and made it impossible for ourselves to go on living the way we know. In Wool, the first of Howey's trilogy, we are introduced to a new way of life. People live in a silo underground where their way of life is governed by their specific skill set. Our protagonist, Juliette, is a worker from Mechanical, way down deep towards the bottom of the silo, but she's shown aptitudes that recommend her for a much higher position. So when the sheriff is sent to "clean" (I'll get to that in a moment), she's given the job, much to her astonishment. Cleaning is the highest capital punishment in the silo. People who commit crimes are loaded into space suits and sent out into an atmosphere largely believed to be toxic in order to clean the sensors that project an image of the outside world (a wasteland) to the people in the cafeteria below. While many say that they won't do this task, without fail, all of them do. Except Juliette... who is also eventually sent to clean. Dust, the final book in the trilogy, ties the knots between these two narratives, and settles the score once and for all. Is there any way out of the system? Can we go back? Read and find out. Find out why this sort of literature is so important. These books are cautionary tales, and speak of the kinds of futures we can expect if we go unquestioning where we are told. Rebellious and anti-government, maybe. Necessary? Yes. You can read more about Hugh Howey here.